The selection of the proper backup wall is often seen as the prerequisite for a long lasting and low maintenance brick veneer cladding. Using case studies of anchored brick veneer with backup walls of steel studs, concrete masonry units, and reinforced cast-in-place concrete, this paper discusses the relative merits of each in view of economics, constructability, and their role as part of the building envelope. A continuing debate wages within the professions, industry, and academia over whether steel studs should ever be used as the backup wall Each side has its proponents and opponents who offer research, statistics, and opinions to substantiate their reasoning. 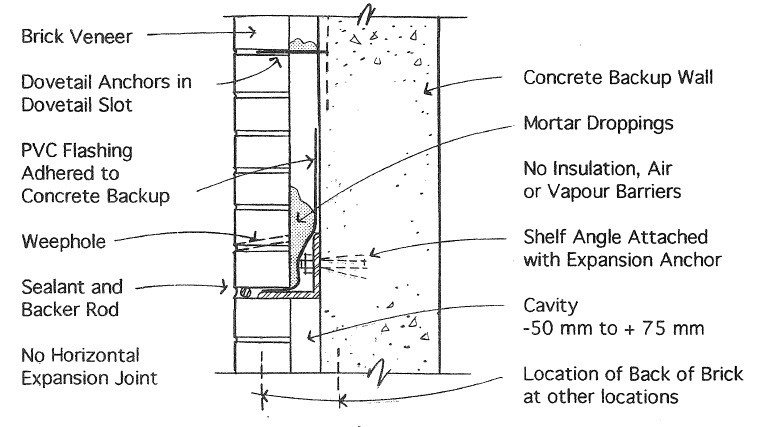 This paper concludes that although a steel stud backup has more associated risks than a concrete or concrete masonry backup, the longevity of anchored brick veneer may be more dependent on proper design, detailing, and construction of the entire building envelope system than on the selection of the material for the backup wall. It is also concluded that the economics of construction in Canada and the United States will likely dictate that steel studs will continue to be frequently selected as the backup for brick veneer.